Ancient Iranians believed that Sun is the center of energy and the lion was the symbol of bravery and power, and kingship. 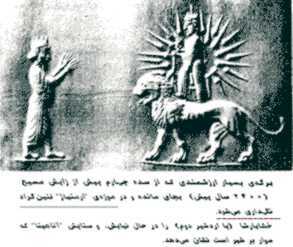 Mithra the found of ancient religion or "love and peace" which was ancient religion of Iranians believed that a "mesaiah" will come to rescue the humanity and will destroy the caw that is sitting on the nuritions as the symbol of most commodity. Mithra that was believed to be sun's son is powerful enough that will destroy the caw. therefore in most archeological documents and carving we see an angle or a lion fighting with a caw (Persepolise, Apadana Palace's stairs). Therefore an artifact engraved with Lion and Sun with portrait of an angle who represents Mithra has been discovered in most ancient archeological discoveries. The famous "Derafsh Kaviani" which was made by and an artisan smith using his apron carried three different ribbons hanging from the bottom in Red, Purple and yellow. 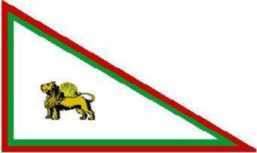 During Afshari dynasty, Nadir Shah have created rectangle flag, red, white and green using Lion and Sun as emblem. During Kajar dynasty Fath-Ali-Shah have developed one flag in red with a sitting Lion (no Sword) representing war time, one flag with sitting lion (with sword) on the green surface representing peace time, both lions Sun's reflection covered all surfaces of the flags. Later Amir Kabir who ordered military compound are build on the places of the Mosques, all solders are worn uniform using Iranian cloth and buttons are decorated with Lion & Son. 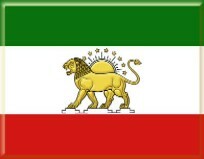 He combined Red and Green color from Afshari era with addition of White in the middle with Sun & Lion as the symbolic flag. During Mohamad Shah Kajar House representative recognized Red, White, Green flag with Lion & Sun carrying sword as the national emblem. 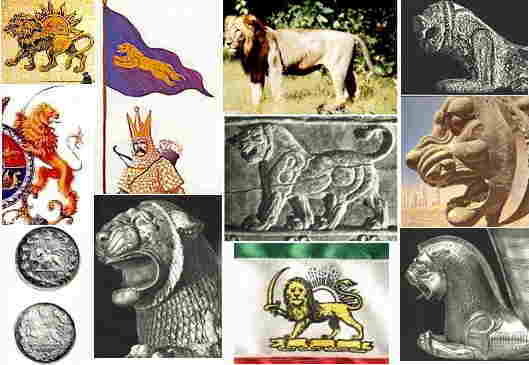 Khomeini ordered all Sun & Lion emblems removed from monuments, historic building and governmental stationeries even if it is going to cost arm and leg. Iranian patriots are waiting for the Sun and Lion to come out from behind this darkness era in the near future. Whereas, lion (Leo as the astronomical sign) coincides in the hottest period of summer (23 July-22 August) which expels the most energy. So, the combination of Lion and Sun on our flag is indicative of the power of our Nation. These signs have remained as our emblem ever since. A compassionate Iranian never relates this emblem to any particular ruler or dynasty. The above NEW design of flag is not to impose any kind of flag to our country or to promote a drawing that a young artist made for self, without any pretension, following a conversation that broke between artist and another friend. نمونه پرچم های پيشنهادی بالا به هيچ گونه تحميلی بحساب نمی آيد. اين پرچم ها با فکر صاحب اين تارنما از سوی يک هنرمند ايرانی برای اين تارنما فراهم شده است باشد که روزی بجای شمشيری که نماد خونريزی، جنگ و نماد شکست ايرانيان در مقابل هجوم بی امان تازيان بوده است يک مشعل که نماد دانش، همبستگی، گرما، و نماد يگانگی است جايگزين شود. ايرانی ميهن پرست اين نشان را به شخص يا قبيله خاصی منسوب نمينما يد. As we all (Iranian) are concerned about the future of our country, the deliberation will be upon us about the kind of flag we should have in a new and liberated Iran. The above design has been circulated to over 3000 people. I am delighted to announce that many concern Iranians expressed overwhelming interest in this issue. Does the current Iranian flag (with foreign writings on it) represent every Iranian, including all ethnic groups and "Iranian" in whole? Should we have our famous "Shir-o-Khorshid" flag back? 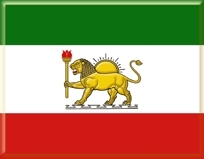 Should the lion on the flag look "Iranian"; or, resembles to other lions on Non-Iranian flags? Due to the fact that a secular (laic) regime is the ultimate goal, separation of "Religion" and "State", then shouldn't Iranian flag lose the sword, which apparently represent "Zulfaghar"? It is believed that any form of symbol representing a religion, or a group will be invasion of equality of rights for all, political, religious and ethnical groups? Artist's admiration to stylize the ancient art and nature easily is visible in this design. Beauty, originality and worldly admiration of our history are well implemented in the suggested model. (I draw your attention to the lions from engraved historic heritage). In this design to well maintain and balance the logo the "White" has to be wider. Therefore, the width of the flag is divided into 7; then, 2 parts has been used for green, and 3 for white and 2 parts for red. We are commissioned to have our flag changed to something more nationalistic, therefore the style of the design would also be seriously considered. If we are to choose the sword and shape of the sword (Shamshir), my continued research, and reading some interesting texts about wars during different periods and discussing this matter with some military specialists lead me to the following findings. The techniques of fighting continued changing during the history in many countries. During the antique period, the shape of the sword was straight and short in all known civilizations such as Greece, Persia, Assyria, Rome, etc… The sword was short because it was easier to pull out from its sheath (ghalaf). During Ashkanian and Sassanian, as the combats took place between two heroes from each side, the sword became long and heavy. They used to carry it with two hands. This same shape and type of war was adapted by the Europeans during the middle age. Later, when fighting on horse back became more common, the shape of the sword also changed. It became more circled for two reasons. One, because it was easier to pull out from its sheath on a horse. If you move your hand from the left side of your belt to your right upper side, you will notice that your arm makes a circular move. Therefore, the sword took a circular shape. Then, as we can see in the architecture, an “arch” is stronger than a straight line. Therefore, the sword, taking a circular shape was easier and faster to use, more solid and less likely to break during the combat. This new shape was used and is still used everywhere in the world. Of course, in each culture, the craftsmen use their local artistic motives to decorate the handle and the sheath, and to give a more “local” design. Therefore, we Iranians should once and for all stop associating the curved sword with the Arabs and accept the fact that this shape is universal. The misunderstanding and the nonsense about the shape of the sword started from the Ghajaar period, when, trying to include shiism in our national symbol, they suggested that the sword was “Zulfaghar”! Aaccording to the religious legend, “Zulfaghar” had two blades!!! this a “Legend” because the common sense can not accept a sword with two blades! Just imagine how it was possible to carry a sword with two blades, and in what kind of sheath they could place it!... This is another religious nonsense made by the Islamic fantasists, like their “hadis”, miracles, “Jen” and “Pari”!